The Circle of the Holy Eucharist story helps teach the children about the parts of a worship service including communion. This story is found In volume four of Godly Play. There is another Godly Play story called "Symbols of the Eucharist." Our east wing Godly Play room has miniature figurines that will allow you to tell this story and show the placement of the altar, kneeling rail, sacristy, and pulpit to help the children understand all of these elements. Create Last Supper Chalices for communion. 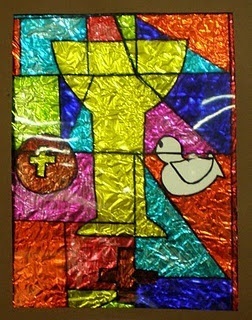 Symbols of Communion with foil and stain glass paints.